I was in a Mediterranean kind of mood the other day, so I decided to grill up some burgers and top them with feta, parsley, lemon and oil, and served this simple and delicious Greek Salad on the side. Hope you enjoy! It really doesn’t get much easier than this one… Just combine all of the ingredients in a large bowl, not including the dill, and mix them together thoroughly to evenly coat the vegetables with the seasoning and dressing. I strongly recommend making this à la minute. If you make it too far in advance the yogurt/lemon dressing becomes very runny. 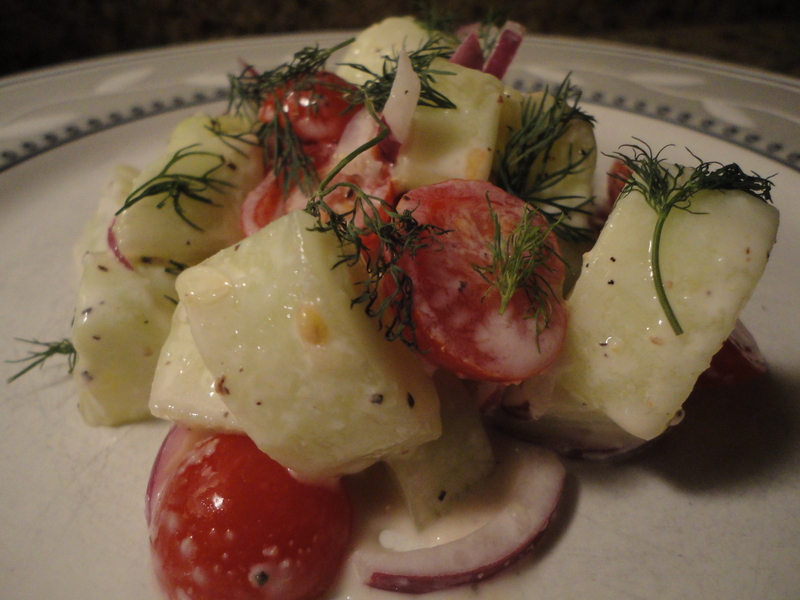 Garnish the salad with the dill when serving. If you mix the dill into the salad it will dominate. It’s better to just top it with a few sprigs for nuances of flavor. Lastly, if you would like to do this as a Vegan salad, feel free to replace the yogurt with extra virgin olive oil… I would recommend two tablespoons of olive oil to replace the four tablespoons of yogurt. Tags: greek salad, perfect pairings, perfect pairings at home. Bookmark the permalink. Looks incredibly fresh and delicious! Thanks for including a vegan option. I can’t wait to try this!